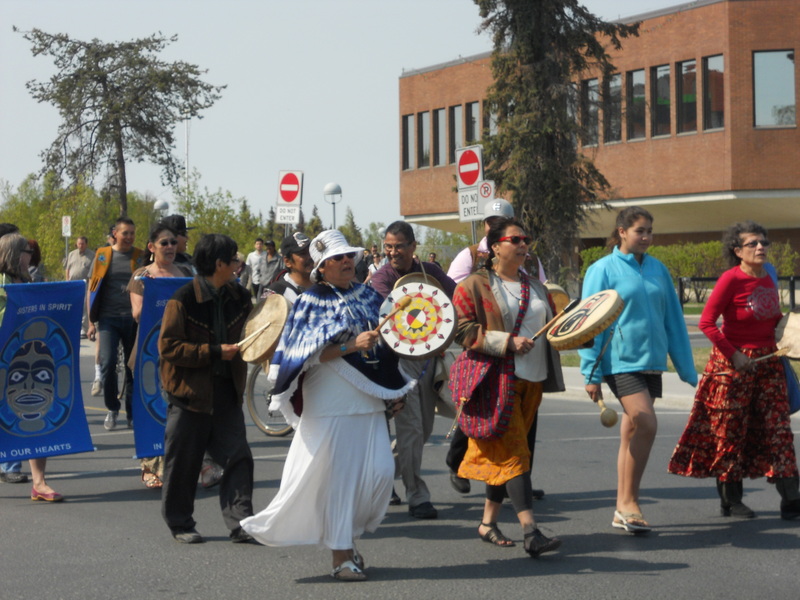 For a small town, Yellowknife has more than its fair share of residents who represent a number of different nationalities and cultures. Many people don’t believe me when I tell them that the most common non-official language here is Tagalog. The Aboriginal population makes up half of the territory’s residents, leaving another 20,000 people to form an eclectic mix, which is concentrated in the capital. 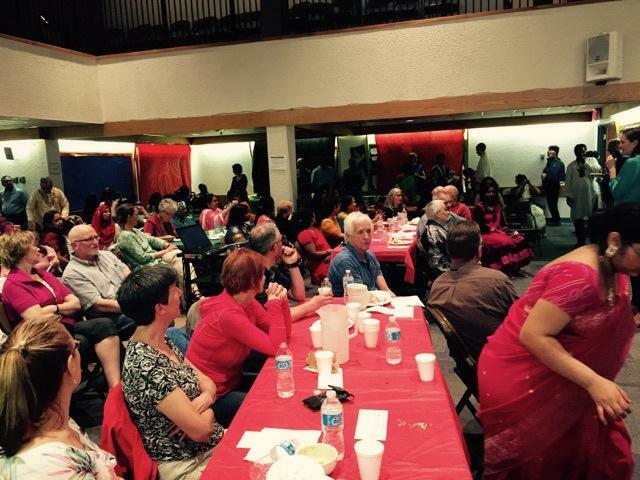 Yellowknife’s Bangladeshi community is some 50-strong and they got together this month to hold a feast to raise funds for the Centre for the Rehabilitation of the Paralysed (CRP) back home. The CRP is a hospital that offers much-needed medical services to people living with disabilities, as well as services such as speech-language therapy, occupational therapy and physiotherapy. It’s the only one of its kind in Bangladesh and it needs all the financial help it can get, considering the large population that it serves. 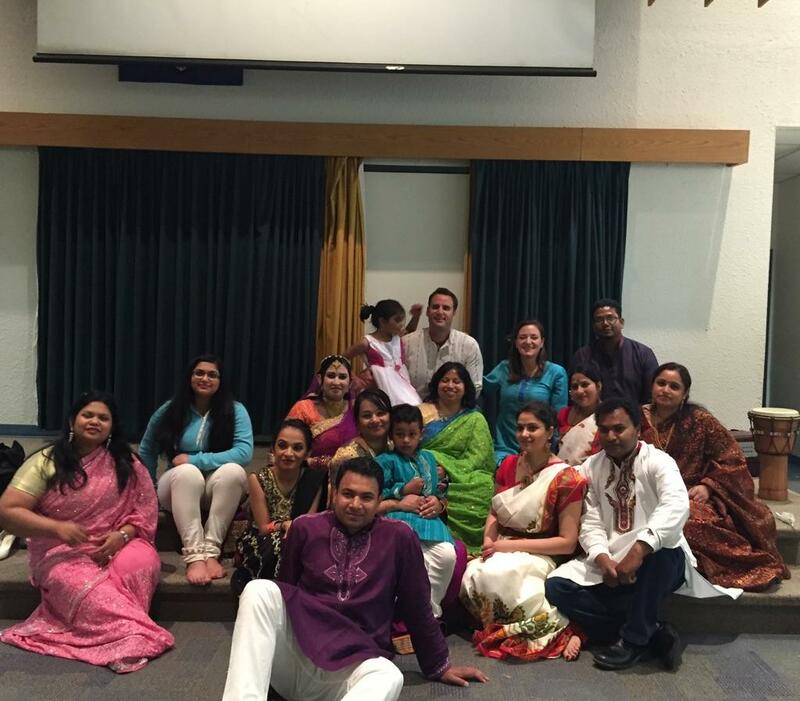 A community event with a healing twist took place on May 31st. 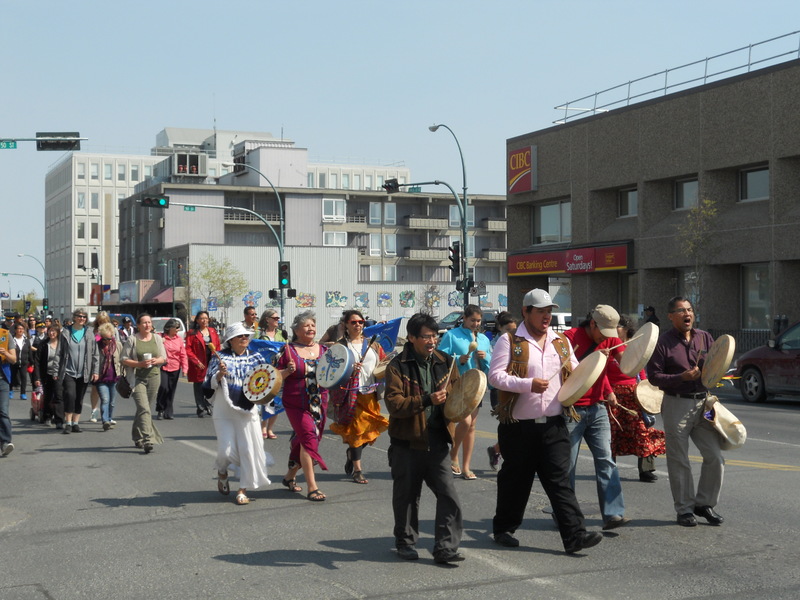 To mark the end of the Truth and Reconciliation Commission, a Walk for Reconciliation was held in Ottawa and in various parts of the country, including in Yellowknife. The Truth and Reconciliation Commission (TRC) was formed in acknowledgement of the trauma and the detrimental consequences suffered by generations of Aboriginal, Inuit and Metis children who attended residential schools. Among the commission’s objectives: to allow survivors a safe and culturally approriate setting to speak about their experiences, to have their stories validated and the effect on their lives acknowledged; to promote public awareness and understanding of the residential school system and its legacy; to produce a report that will serve as a public record; and most important, to recommend a way towards healing, for the survivors and for all Canadians. The pernicious effects of the residential school system are still being felt to this day, as I described in Walking in the Shoes of our Sisters and Brothers. Young children were separated from their families and placed in schools where they were subjected to what was essentially cultural de-programming, with generous doses of cruel mistreatment and physical, emotional and sexual abuse. While delivering a speech earlier this month, the Chief Justice of the Supreme Court referred to it as “cultural genocide”, a description with which the chair of the TRC agreed. 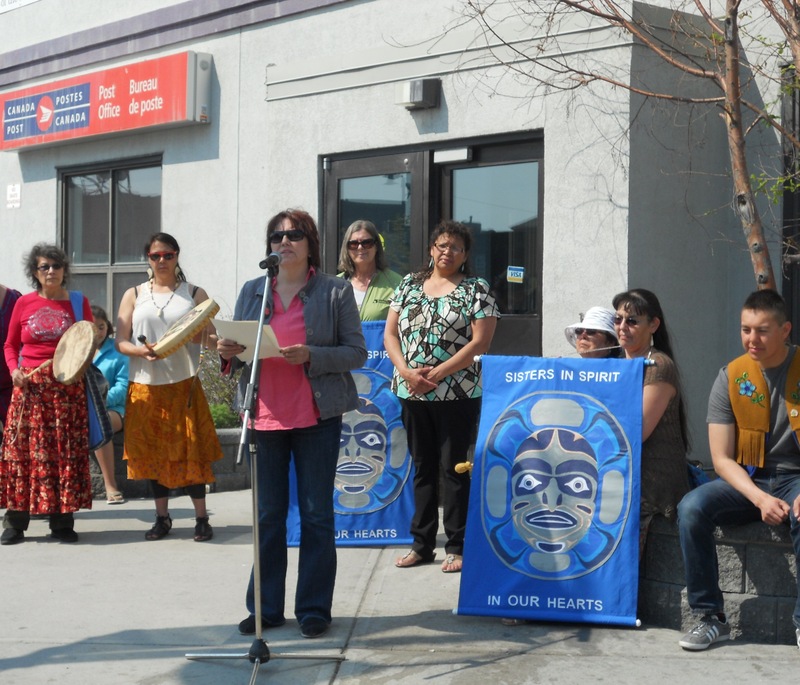 The TRC has been at work for 6 years, during which time it has heard the testimony of some 7,000 witnesses. In its report, the commission has updated the estimate of the number of children who died in these schools to 6,000, from the previous 4,000. In truth, the actual number will never be known, due to lack of records. There were approximately 150,000 students who passed through these schools, of which an estimated 80,000 are still alive today. For those who suffered the worst of it, the journey to healing can be a long one. 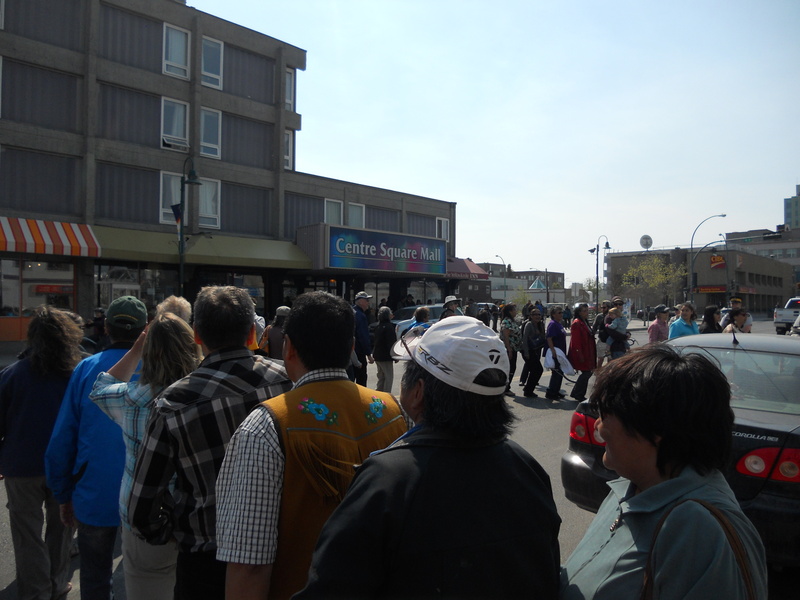 The Walk for Reconciliation in Yellowknife began with a gathering at Civic Plaza. It was a sunny Sunday morning and people strolled in, while others who simply happened to be walking or cycling by stopped to see what was going on. 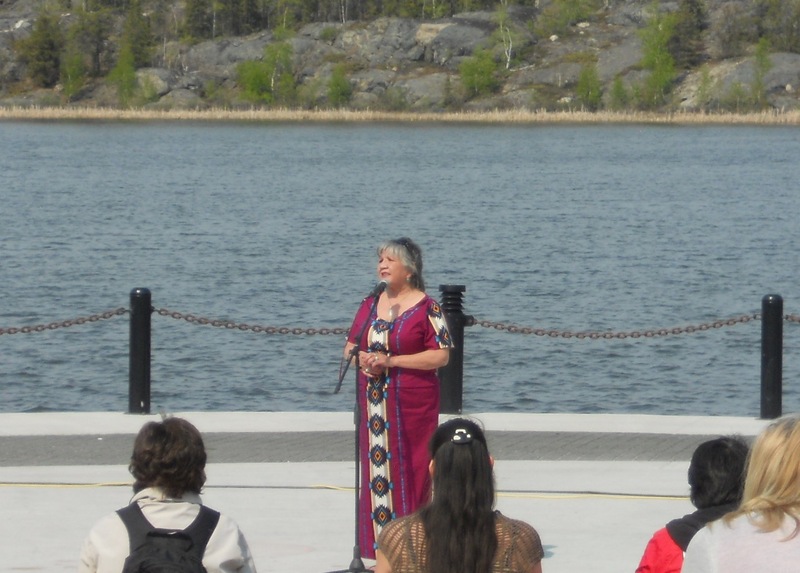 Well-known local personality Gail Cyr was the MC, and she gave a warm welcome as people settled in the terraced area facing the stage, with Frame Lake in the background. 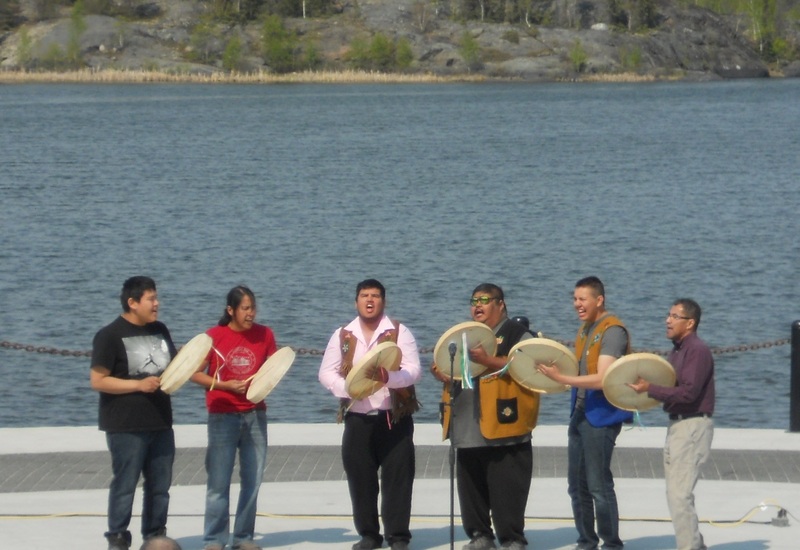 She invited the Yellowknives Dene First Nation Drummers to open the event with a prayer song. They played and sang softly and reverentially. Then they livened things up with their usual full-bodied singing and drumming. As is customary, people couldn’t resist and in no time a circle of dancers formed on the stage. Having people show their appreciation by dancing to the music seemed to give the drummers even more gusto. 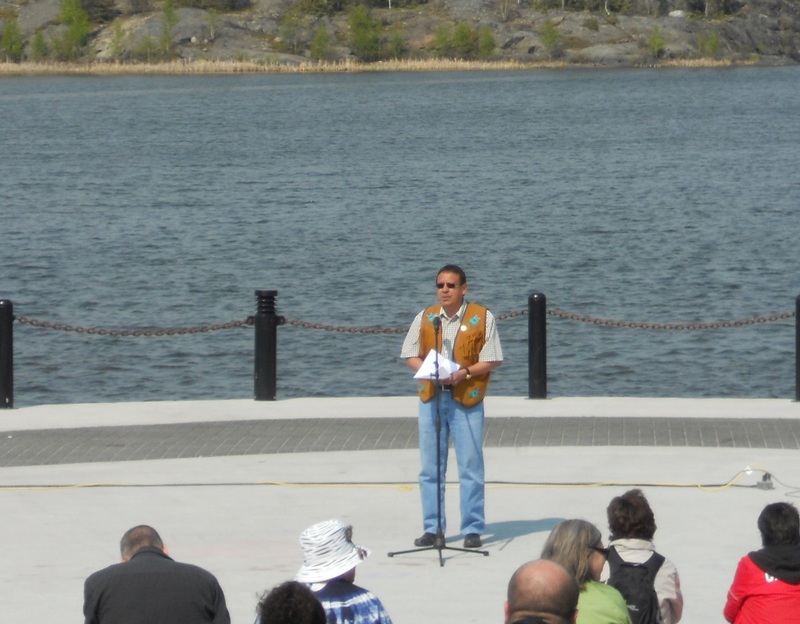 Afterwards, there was a short welcome speech by Ernest Betsina, the Yellowknives Dene First Nation Chief of Ndilo. He revealed that he too is a survivor of residential school, so he understands first-hand the effect of that experience on people’s lives. 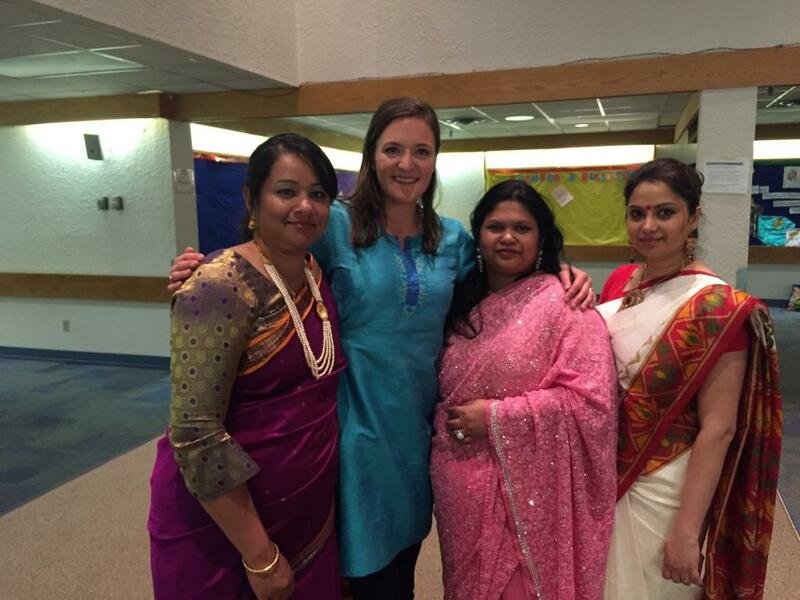 It was a necessary reminder that in our everyday lives, many survivors are walking among us. 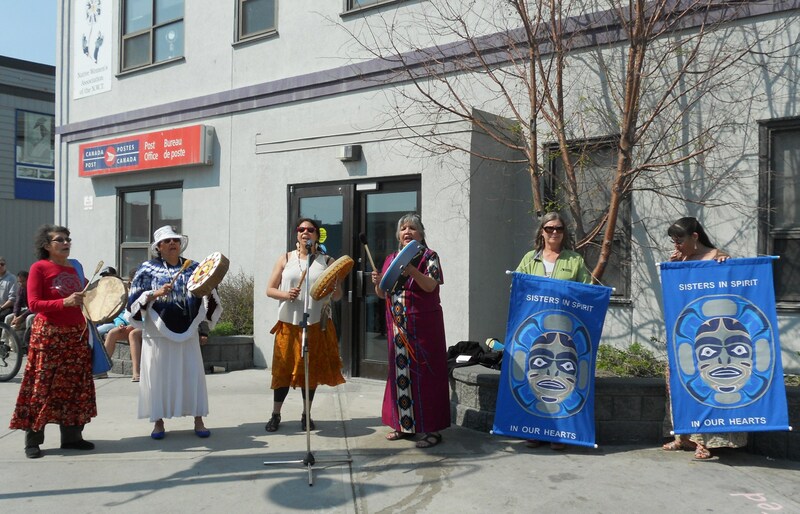 Then the walk began – led by women singing and drumming – down Veteran’s Parkway and up 49th Street to Franklin Avenue, the main street, where we stopped outside the Native Women’s Association, which is upstairs of the post office. By now the RCMP had blocked off traffic in one direction on Franklin, so the crowd spilled into the roadway. There were two short speeches, by representatives from women’s organizations. 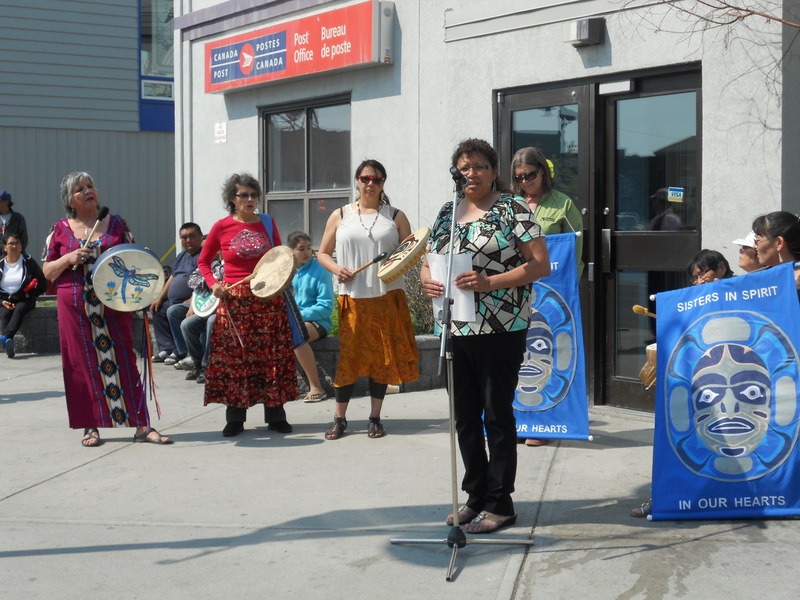 One was by Paulina Roche, the President of the Native Women’s Association of the NWT. The Association supports Aboriginal women and their families in preserving their culture, language and heritage, and in achieving equality and justice. Another was by Brenda Norris, the Vice President of Pauktuutit, an organization that represents Inuit women. Its goal is to foster greater awareness of the needs of Inuit women, to promote their rights and push for better social, economic and political conditions for them. 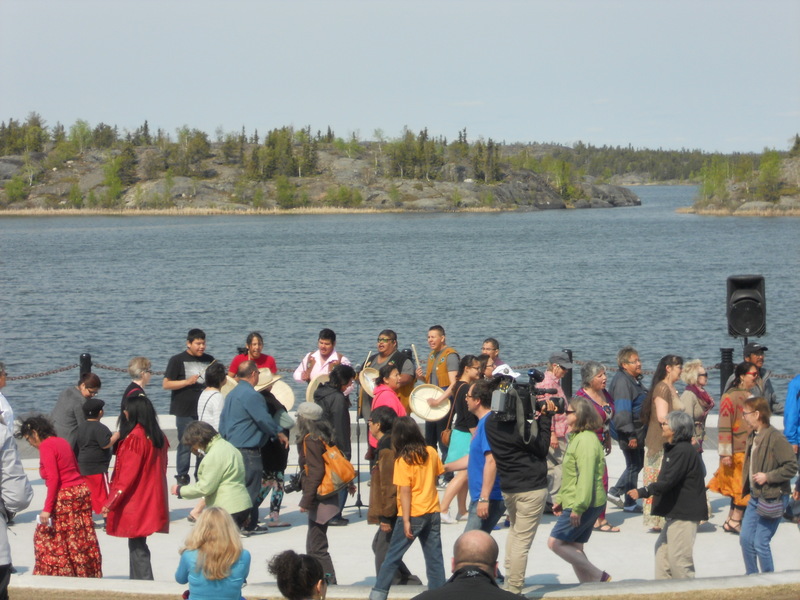 Then the Yellowknives Dene First Nation Drummers performed again, and the dancing recommenced. More room was needed to form the circle, so the RCMP blocked off the remaining traffic and people literally danced in the street. When the drummers finished, people were just getting into the swing of things, so there were calls to do one more song, and they happily obliged. The drumming was so infectious that even a member of the RCMP joined in the dancing. The last item on the agenda before we moved on was some more drumming and singing, by the ladies this time. They started with a Cree healing song, which was appropriate for the occasion. 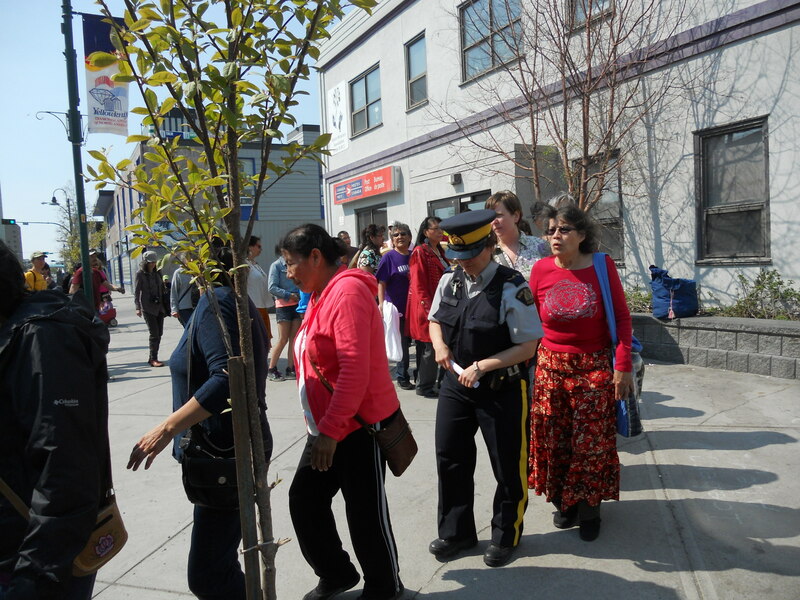 At Northern United Place, walkers were treated to refreshments, snacks and bannock. The TRC final report will be issued on June 2nd and it will be 6 volumes long. The truth is out. Here’s hoping that it helps us all to be more educated, more understanding, and to heal.